The Avengers really do love to keep everything in the family. Feeding on despair, Eric Williams ushers enemies to their demise with his life-draining scythe! He's not only evil, he's also a freaking lunatic, and his face reflects that. 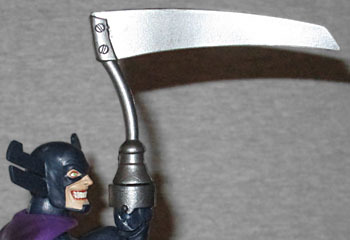 Whichever one of Hasbro's nameless sculptors was in charge of Grim Reaper gave him a huge amount of personality. He's grinning like a mad man, showing every tooth he has. His pupils are solid green, suggesting his weird mystical powers. And of course, those utterly daft antlers on his mask? Oh yeah, they're here. No escaping those. 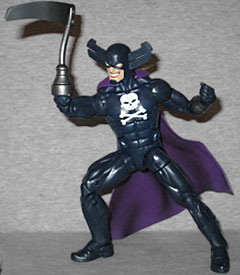 Other than the inexplicable horns, Grim Reaper has a very simple costume - a dark blue bodysuit with a white skull and crossbones on the chest, and a purple cape. That's it. But that's fine, because his dull clothes won't distract us from the fact that he has a new body! It's a bit bigger than the small body, but not as crazy-huge as the big body. It's thick and muscular and will serve a lot of characters very well. A lot of characters, but not necessarily Grim Reaper - he's spent so much time dead that he's often kind of skeletal. At one point he had to drain the life from a living being once every 24 hours or else he'd die again, so imagine he just sucked someone up, and that's why he's so big. When he first appeared, Grim Reaper's scythe was basically just a fancy glove that he wore over his hand - it wasn't until the '90s that he had his hand amputated and the scythe grafted in its place. The moral of that story is "never have a team-up with Ultron, 'cause Ultron don't give a &*$@^ about you, human." The blade on this toy doesn't quite match the design in the comics - the back of the blade is flush with the shaft, rather than having a few small points jutting off it - but it turns where it meets the wrist, and looks really dang cool. The figure may have a new body, but he's got all the same articulation: a balljointed head, hinge neck, swivel/hinge shoulders, swivel biceps, double-hinged elbows, a swivel/hinge wrist (since the other wrist, being his blade, is just a swivel), a hinged torso, swivel waist, balljointed hips, swivel thighs, double-hinged knees, swivel shins, and swivel/hinge rocker ankles. 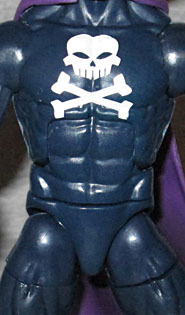 The hips are still the kind that only go out about 45° to the sides, but better that than the sort Thanos had. Grim Reaper doesn't have any accessories, but he does come with the left leg of this series' Build-A-Figure, Ultron. Movie Ultron, not comic Ultron. 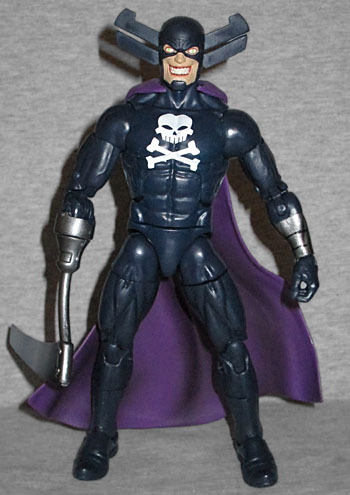 If you had come back from the future and told us that there would one day be a Grim Reaper Marvel Legend, and that he would be 100% new sculpt, we would never have believed you. Those sound like the words of a madman. But here he is, and it's all true. Yes, this is a body designed to be reused, but it's debuting here, and so far only this unlikely Avengers enemy is using it.